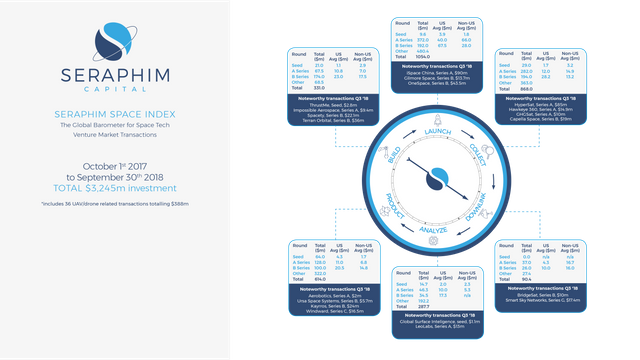 The Seraphim Q3 2018 Space Index shows $3.2 billion global VC investment in space over the last year, maintaining the strong momentum we saw in 2017. 2018 has been a year of small launch rockets; investment remains concentrated in Upstream. The Launch sector continues to receive the highest investment flow at just over $1 billion, while Data Collection Platforms (satellite constellations and drones) follow closely behind at $868 million. Together, these two Upstream sectors account for close to 60% of total VC investment over the last 12 months; while the Downlink sector continues to receive the lowest overall investment (3% of total) at $90 million. Significant launch investment in China; still need to demonstrate success in orbital flight. iSpace China and OneSpace were two of the largest transactions in Launch at $90 million and $43.5 million, respectively. Both are Chinese small commercial launchers founded after the government opened the space sector to private investment in 2014. Both had successful suborbital launches in September. The big test for China’s emerging space start-ups will now be orbital spaceflight after LandSpace, a leading start-up, failed in its first attempt to put a satellite in orbit over the weekend. Two notable transactions led by large aerospace and defense companies were Hawkeye 360 and Bridgesat. Hawkeye is a geospatial analytics start-up launching a smallsat constellation to collect radio frequency data for applications such as Maritime Awareness. The company raised $14.9 million in a Series A round led by Raytheon. Bridgesat is developing a global network of optical ground stations to enable faster, secure and reliable big data transmission at lower cost. The company raised a $10 million Series A round led by Boeing Horizon Ventures.